The reaction to his speech suggested that Schmidt was saying what many were already thinking. In February, the Next Gen report, written by technology industry heavyweights Ian Livingstone and Alex Hope, had argued that the British video gaming and visual effects industry was losing its edge, in part because the ICT curriculum in schools was focused on office skills rather than programming skills. The Royal Society’s report, Shut Down or Restart?, published in January this year, described the teaching of computing in schools as “highly unsatisfactory”. In January, spurred on by Schmidt’s speech, the Guardian launched the digital literacy campaign in partnership with Google to improve the teaching of ICT. The education secretary, Michael Gove, meanwhile, announced that the current ICT curriculum, which he described as “demotivating and dull”, would be replaced by a “flexible curriculum in computer science and programming”, the content of which is to be announced in September. Some of the key issues in improving the teaching of ICT in schools were discussed at a recent debate on digital literacy hosted by the Guardian in association with Google. The debate was held under the Chatham House rule, which allows comments to be reported without attribution, to encourage an open discussion. The roundtable heard that the current ICT curriculum in schools, based on teaching office-based software, was not equipping children with the skills they, or industry, need. “Children know how to consume technology but not how to create it,” one contributor said. As a consequence children have lost interest in studying computing: the number of computer science graduates has been falling for several years, and the country now has a shortage of technological innovators. “Against all odds, we’ve managed to put them off technology for life,” said one participant, suggesting that a focus on teaching pupils using basic software over a period of years had “squeezed the creative juices out of them”. Yet participants agreed that children were enthusiastic about the idea of learning more in-depth ICT skills. They should be given the opportunity to find out whether they would be suited to a career in coding. “Every child should be given the chance to discover that they have the aptitude,” said one contributor. Israel was cited as one example where the teaching of computer programming had been introduced in schools over the past 12 years and was now a world leader in technical innovation. Digital literacy covers a spectrum of skills, from the ability to use simple applications at one end to the ability to write computer programs at the other. Other mid-level skills, such as using HTML to create websites, fall in between. The roundtable agreed that all children should have the opportunity to learn to use digital technology. “Digital literacy must take its place alongside reading, writing and numeracy as a really valuable component of general economic success,” said one contributor. Coding needed to be taught in schools, not just because the technology industry needed excellent coders, but because it was useful in a whole range of jobs. “It’s going to help everybody, even people who don’t become computer scientists,” said one contributor. However, it was felt that many children were still unaware of the job opportunities available in ICT or the fact that people who worked in technology-only occupations earned a third more than those working in non-technology occupations. Businesses should be encouraged to provide better routes into ICT careers by providing apprenticeships, said one industry participant. There was also a lack of awareness of opportunities in ICT, which was exacerbated by a snobbishness pervading the education system, participants were told. Subjects such as maths and physics were more highly valued than computer science and engineering, a contributor said, and middle-class parents wanted their children to become lawyers and accountants, not computer programmers. The country needed to address the problem of the digital divide, participants agreed. Despite an initiative by the last government to equip low-income homes with broadband and PCs, it was noted that many children from poorer families still didn’t have access to computers at home, hampering their ability to become competent users. Participants agreed that if schools wanted to embrace digital literacy, they needed to take a less cautious attitude towards ICT. Many children were enthusiastic and confident smartphone users, it was said, and schools that ban mobile phones missed out on the opportunity to use them as learning tools in the classroom. Some teachers found it hard to cope with students being more at ease with technology than they were. “We have to make teachers feel comfortable with the fact that some of their pupils will know more about these technologies than they do. It doesn’t mean they know more learning about using these technologies,” said one contributor. An industry participant expressed concern that the pressure of league tables made schools reluctant to experiment and innovate. Contributors argued that some schools were doing an excellent job of making ICT exciting within the constraints of the curriculum. In others, however, the lack of qualified teachers could prove a management challenge when it comes to implementing the new curriculum. The point was made that in secondary schools many of the existing cohort of ICT teachers started out teaching business studies – they had little or no coding expertise and may be reluctant to teach the new curriculum. The question of digital safety was also raised and acknowledged to be a major issue for schools, especially primaries, and particularly around the need for rigorous controls to protect children on the internet. Technological controls, such as firewalls which restrict access to certain sites, need to be complemented with educating children about the dangers from a very young age. “The internet is like any city – it has its sewers, but we teach our kids not to lift the manholes up and dive into the sewers,” said one industry contributor. Participants praised the work of the Computing at School (CAS) working group, a grass roots organisation that is supporting teachers by providing them with good quality curriculum materials, training and the opportunity to meet like-minded colleagues. 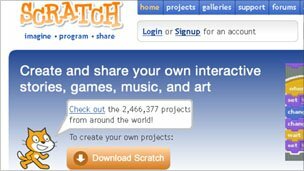 One example from the wealth of free internet resources available for teachers, the roundtable heard, was Scratch, a visual programming language that teachers can learn in a matter of hours and can be used to teach children how to create animations and games. Using the relatively simple tools of HTML and CSS, primary school teachers can inspire pupils to create websites, said one contributor. “I’d like to see the language of the web as the bedrock of programming in primary schools,” they said. Another participant enthused about the workshop run by Decoded, which teaches people essential coding skills that enable them to create a web-based application in a day. However, concern was expressed about a lack of physical resources. One contributor said that their school had invested in laptops for every child six years ago, and that although the laptops were well used, there was no money to replace them. It was also felt that money spent on ICT had not always been targeted effectively. The last government spent large sums on equipping schools with ICT hardware because of a prevailing belief that ICT was “transformational”, but not all schools had been able to make good use of it, one participant said. It was suggested that schools would have to look elsewhere for support. Parents were an excellent untapped resource, and one participant said that their school had benefited from joining the Microsoft IT Academy programme which, for an annual fee, provided schools with teaching resources and professional development for staff. Some industry participants felt that businesses could do much more to support schools – for example, by encouraging their own staff to help out in the classroom or run after-school computer clubs. Google had already announced plans, the roundtable heard, to support the Teach First charity by funding the training of 100 science and computer science teachers over the next three years who would work with children in poor areas. Do smart devices make smart kids? I grew up with Ladybird books. They looked pretty old-fashioned when I was reading them and they seem to belong to a bygone age in the era of iPads and e-books. These days, with the toddler acknowledged as the family’s tablet expert, children often learn to navigate the internet before they learn to read. But are smart screens making our children smarter or simply creating a new generation of “square eyes”? In the US most young children have access to a touch-screen device and, according to Daniel Anderson, a professor emeritus of psychology at the University of Massachusetts, using these devices could be more addictive than watching television. A young child will look away from a TV screen about 150 times an hour, but a well-designed iPad app is more engaging because the child is touching the screen to generate actions. Reading crisis Book or e-book reader? Which is best? Half of all US 10-year-olds read poorly, according to Dr Michael Levine, executive director of the Joan Ganz Cooney Center, which was set up to research how digital media impact on learning. One of the centre’s studies, using an iPod Touch, found that the vocabulary of 13 five-year-olds improved by an average of 27% after using an educational app called Martha Speaks. Another study, using a different educational app, had a similar result, with three-year-olds showing a 17% gain. Its latest research compared how children learned using traditional books versus e-readers. The conclusion was that for young children traditional books were more effective in focusing attention on literacy skills while e-readers helped older children maintain attention and excitement with books. But even then the picture is complicated. 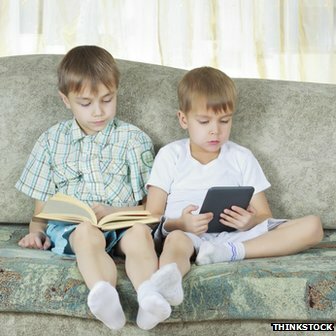 “Children may be distracted by the bells and whistles of enhanced e-books. They may be engaged but many are not comprehending as much,” said Dr Levine. The idea that apps and touch screens are now constant companions for young readers was the inspiration for MagicTown, a fantasy world built around classic children’s books such as Elmer, Winnie The Witch and Little Princess. The site is trying to bridge the gap between the screen-based digital world and a time when families gathered around to listen to stories. Every time a child listens to a story, they create a new house in the town. They can choose a variety of modes for stories, from basic listening to modules that require them to participate in the story. Even in the web age, stories maintain their power said David Begg, chief executive officer and co-founder. “Story is the best medium to teach children. From the village elder importing stories from generation to generation, it is how people learn about emotions, morals and the structure of society,” he said. In Magic Town the village elder is a lion called Louis who will tell different stories to children daily. The tree at the centre of the town grows more leaves the more stories listened to and withers if none are read. “It is not about ramming books down kids throats but about engaging them,” said Mr Begg. “We wanted it to be something that parents think is valuable for their children,” he added. The model of children learning alongside adults is thought to be the ideal, but in parts of the world with low literacy rates it is simply not possible. In such places, the screen may take the place of a parent or teacher. Prof Sugata Mitra, whose “hole-in-the-wall” terminals offered children living in the slums of India their first experience of computers. Now, in conjunction with the Massachusetts Institute of Education, he is experimenting with teaching children to read without adult intervention. “We are trying to find out if children can learn to read by themselves,” he said. He and his team have created reading software which has been installed on computers in three villages in central India, one in West Bengal, plus in a slum school and household in Calcutta. The trial runs until the end of the year. “The field reports so far are exciting. Children are starting to read already,” said Prof Mitra. Just how technology can be harnessed to help children learn in better ways may be unclear, but it is obvious children’s perception of books has radically altered. “Really young children look at a real book and think that it is electronic. They try to swipe it and think it is broken when nothing happens,” said Dr Levine. Volunteers have kicked off a project to set up after-school clubs that teach young children how to programme computers. Called Code Clubs, the sessions will aim to instil the basics of computer programming into children aged 10-11. The clubs will be built around practical hands-on tasks that will include children making games and eventually controlling robots. 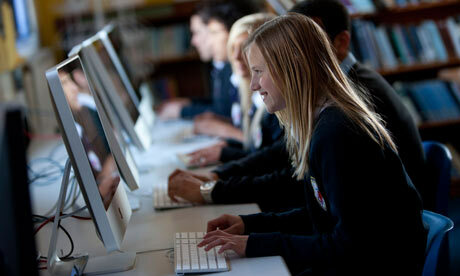 It aims to have 25% of the UK’s primary schools running a Code Club by 2014. Free codeThe clubs will sit alongside a broader national push to reform current computer lessons. These are based around children learning to use software found in offices and businesses, said Clare Sutcliffe who, with Linda Sandvik, dreamed up the Code Club project. “We’re teaching our kids to be secretaries rather than programmers,” she said. The government is in the process of changing what children learn about computers following a successful campaign that showed how important basic programming skills would be in the future. Ms Sutcliffe said Code Club would “slot neatly alongside” changes to the national curriculum that emphasise programming. Although in its early days, Code Club has about 100 volunteers signed up ready to help and has begun work on writing notes to guide what the clubs will teach. Ms Sutcliffe said club sessions would be based around Massachusetts Institute of Technology’s Scratch tool which lets children try their hand at programming by dragging and dropping code elements instead of typing them. Scratch is already used in many schools as an aid to computer lessons for children aged 12 and above. A few schools have volunteered to test out the session plans once they were finished, said Ms Sutcliffe. The first 12 sessions should be free for a school to run, she said. The only extra step a participating school would have to take would be to download and install Scratch on its computers. Code Club plans to get volunteers rather than teachers running the sessions. As well as drawing up session plans, she said Code Club would also give advice and support to anyone that wanted to set up a club in their local school and win over a head teacher and a Parent-Teacher Association to the idea.